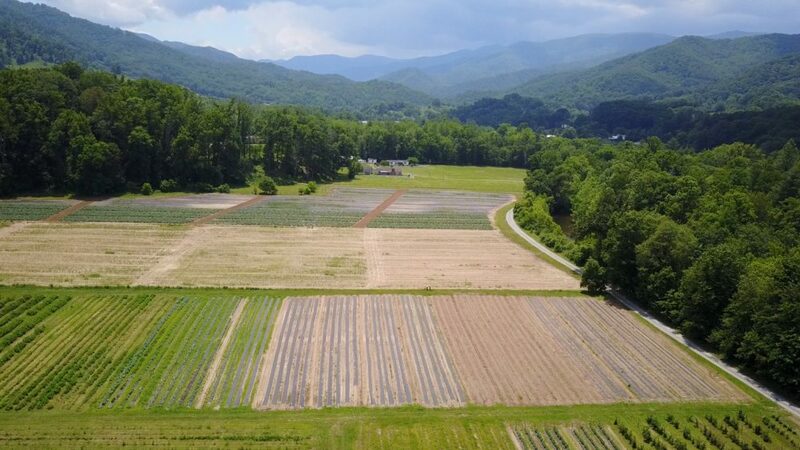 On May 26, 2015, Ted Carr of the Bethel Rural Community Organization’s Farmland Preservation Committee was driving down Lake Logan Road in the Bethel community of Haywood County. He noticed a field that was covered with big, round bales of hay, which were scattered across the landscape. The sight was so beautiful and impressive that it sparked an idea in his head. That same day, he called me and asked if I could drop what I was doing long enough to go get some footage of the hay field before the bales were hauled away. I grabbed my camera and tripod and headed up the road. I shot some footage of the bales in the field, then returned a bit later in the day to capture some shots of the bales being loaded on a long trailer and hauled away. And that was the beginning of the video that would become “The Fertile Fields of Bethel.” I had no idea that it would not be completed until almost exactly 2 years later. “Fertile Fields” was originally conceived as a 30-minute informational video that would tell residents, visitors, and maybe potential residents about Bethel’s status as a farming community, while showcasing the beauty and importance of its abundant farmland. It would feature interviews with local farmers and footage of their fields, and the results of their efforts. It would also feature interviews with several members of a family that operates a dairy farm across the county. Corn and wheat grown in Bethel helps keep their dairy cows fed. As we got into shooting interviews and b-roll footage for the project, it sort of took on a life of its own and started to grow just like some of the plants in those fields. By early 2016, it had shifted from a purely informational video to an informational and educational format. Throughout 2016, more technical information was added, and additional interviews were recorded. Instead of interviewing just farmers, now there were interviews with county residents who support the farmers in various ways, including an agriculture teacher, the manager of a local test farm, a county extension agent, and others. The length of the video doubled to incorporate these extra viewpoints, and it was eventually split into three parts so viewers can watch in segments rather than watching the whole hour at once. Ted came up with a plan to distribute the video throughout the state as an educational tool for use in schools, and created a quiz and answer guide that could be used in a classroom setting. The original idea of highlighting the importance of Bethel’s farmland was still the central focus of the video, but it could now do that as well as educate.